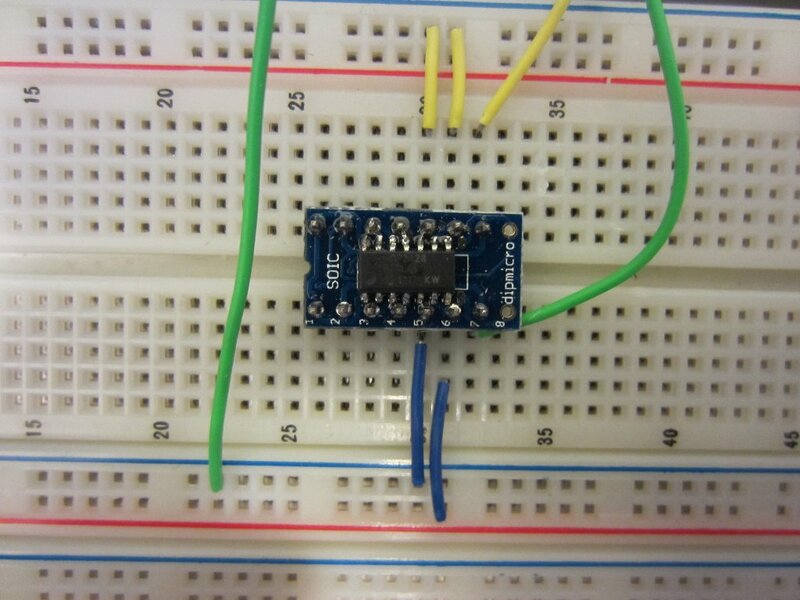 Last time, I discussed how to interface TI’s ADS1112 16-bit delta-sigma A/D converter with Arduino. Today I am going to introduce you to a set of easy-to-program A/D chips from Microchip. MCP3246/7/8 are a family of 16-bit Delta-Sigma A/D converters with an I2C interface. MCP3426 and MCP3427 both have two differential input channels, while MCP3429 has four differential input channels. The programming for all three devices are essentially the same, except for the number of available channels. Compared to the ADS1112 library we discussed previously, you will find that the programming for MCP342X are strikingly similar — the layout of the configuration register is bit-wise identical compared to that of ADS1112 except for the default value of the A/D conversion resolution and the sample rate. ADS1112 defaults to 16 bit and 15 SPS, whereas MCP342X defaults to 14 bit and 240 SPS. One key deference between ADS1112 and MCP342X is how the single-ended inputs are handled. In ADS1112, switching between single-ended and differential measurements changes the analog input pin reference. Under single-ended mode, AIN3 becomes the common input pin and AIN0 to AIN2 become the single-ended inputs. For MCP342X, single-ended operation is achieved by grounding the negative differential input of the channel. So ADS1112 has two differential channels and three single-ended channels and MCP342X has four differential and four single-ended channels. Due to this difference, the programming for MCP342X is actually easier as we do not need to distinguish single-ended and differential operations in code. The Arduino library can be downloaded at the end. As for the ADS1112 library, I only included 16-bit mode. For other resolution and sampling rate, you can change the S0 and S1 bits in the communication register in the selectChannel function. Since differential and single-ended input are handled essentially the same way (except for where the negative differential input is referenced), we do not need to distinguish these two modes in code and thus the mode parameter was dropped on purpose. if yes where will the changes in code. Very informative article sir. Can you please tell me what is the maximum voltage that mcp 3428 can measure. In my application, I have to measure maximum voltage upto 130 volts DC. Can you please provide me some information? Thank you. and install it in Arduino IDE? thanks in Advance for yr answer. I recently uploaded it to GitHub, you can get it there https://github.com/kerrydwong/MCP342X. Let me know if you have any issue downloading the files. About my project, I’d like to read the voltage of a battery and 2 times charging and descharging current. i hope with this library i could get it working!! if I’m not wrong your library could also be used for for the MCP3422 althogh your referencing it to the 6/7/8. MCP3422/3/4 are 18 bits converters. I don’t have any but just by looking at the clock diagram (page 21) I see that the data has 4 bytes where as for MCP3426/7/8 the data has 3 bytes. So you will need to change MCP342X::readADC() and assemble the extra data byte if you are using MCP3422/3/4. 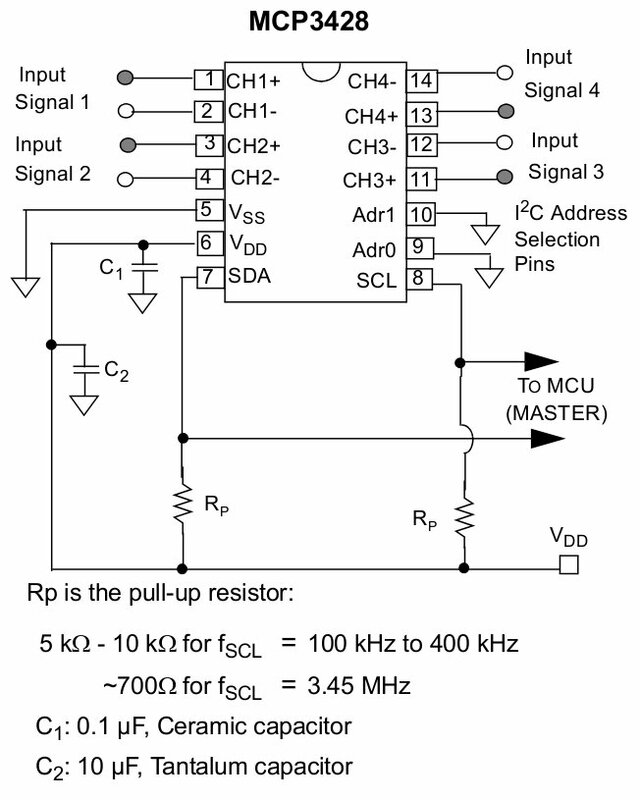 Hi Kerry, can you tell if it’s possible to use only one of the 4 Channel of this chip(MCP3428)? What about other 3 remaining? have i to let them floating or connect them on GND or VDD( i mean chn+ and chn- on the same voltage level with n = channel Nummber). Anothe question ist which GND have i to use?the digital one or analog? On Arduino are both present and i don’t know which one is to be used? N.B: i ask you this cause i got the chip no work!wenn i connect the supply voltage(5V), the chip get hot and i don’t know whats the matter. 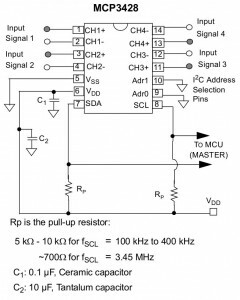 When using just one of the available channels, you can simply leave other input pins unconnected or connected to ground. The analog ground and digital ground are both connected to ground potentials (e.g. 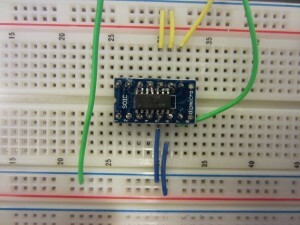 the GND pin on your Arduino). There are some subtle differences between these two grounds. To reduce noise, the AGND pin should be connected directly to the ground plane of the analog portion of the circuit and the digital GND pin should be connected to ground plane of the digital portion. But for simple circuits where noise is not a big concern, both pins can be connected together to your circuit ground reference point. I am not sure if you have already damaged your chip as during normal operation it should not get warm. Hi Kerry, it works, the chip was arleady dead. i replaced it and i got it working. sometimes i use this library and works perfectly. Do you know how to remove this error and get the sketsch in yr example working again? thank you very much for supporting me!! It’s hard to tell what caused this error but by the look of it it seems that it didn’t find the library. But you can easily figure out whether or not the library was located correctly by using the snippet above. first of all thank you for yr help!! Now it works! there was the Problem with my IDE, i’ve reinstalled it and run it again. But i’m still having a problem concerning the maximaum Voltage that could be measured. Someone have asked you above but no answer and i’ve the same problem. ist it possible to measure the voltage between 5 mV and 20 V with this Library? To measure voltage upto 20V you will need a voltage divider before the analog input as the input can not exceed your reference voltage. HAllo Kerry, thanks for all! Now i’m using yr library in my project. I tried to read the voltage fallingacross the shunt-Resistor. For small voltage mearures the MCP3428 very well, but as the voltage increases the error too. Measuring 5 mV i got 4,98mv that okay. and bei 60mv i got 54,6 mV only. I don’t know how i can avoid this. Do you know what may be the cause. i tried my best but in vain. and try changing that to compensate your measurements. (I will add a method later so it can be changed within user code). Hi Kerry, cheers for the library! Found it to be very useful. I was just wondering if you could recommend the best way to read multiple channels in a single loop? I have attached 4 inputs to my MCP3428 and am trying to read both of their values within a single loop of the arduino code. When I try to do this (using the code I’ve pasted below), the values that it reads seem to be random and non-changing and do not respond to the change in input (coming from a potentiometer). Note that when I run your example code posted above with only a single channel being read at a time it responds to a change in the potentiometer. Additionally, if I leave a 100ms gap between when I read the first channel and when I read the second, it manages to read both channels. If I reduce that time however, it resorts back to invalid data. The code you attached seems to suggest that both chips have the same address, which is incorrect, you need to use different address for each chip connected. Ah apologies. It’s probably just ignorance on my part, but I’m using a single MCP3428 chip. In the code I was trying to reference two of the chip’s channels. I was under the impression that I began transmission with the chip using your init function and then I tried to select each of the channels to be read within your selectChannel function. Do I need to use a different address for the one chip when reading different channels? No, you only need to init() once in setup(). In your loop, you can call select channel and then call read. The read will read from the channel you just selected. Really new to the concept of programming and I have read through the .h and .cpp files again and again to figure out how to change the data rate between 12, 14 & 16bit and where to choose continuous or one-shot mode, at first I set out to enable those two parameters. "| mode << BIT_OC | res << BIT_S0"? Or am I way of? I am simply guessing how the library works but if I'm wrong in my deduction I simply need to know how to set(in the library files) BIT_OC, BIT_S0 & BIT_S1, it would help me out a lot. I have more than once found really golden information at your site, thank you very much for your explanations. You probably want to refer to p18 of the datasheet. The BIT_* constants (e.g. BIT_S1, BIT_S0) defined in the header file are the bit locations within the communication register and if you want to set that bit you would left shift 1 by the number of bits. So if you want to set the S1 bit, you will do a 1 << BIT_S1. I have read from the datasheet that the vref can be changed from 2.048 v to 4.096 v,but am not sure of how to do that.I am using it in single ended mode. For some reason this code receives all the values but like I said only the first six values change over the time, the other ones remain static the whole time. I was trying to use your library to solve this problem but to be honest I couldn't figure out how to make the instances of all my 6 MCP3428, and also I couldn't undestand very well how the following line works? Do you have any idea why is this happening? and do you have some suggestion to solve my problem using your library? You should be able to create 6 instances MCP342X and use the call init to supply the I2C address for the each individual MCP3428. e.g. MCP342X ic1, ic2, ic3…. Hi Kerry, thanks for providing this library, it isvery helpfull. Can’t remember why I did that. But does look like it should be t-=65536l instead.